WASHINGTON — Two Thanksgivings from now, people flying in and out of Dulles International Airport could be taking the train there and back. Construction on the Silver Line extension could wrap up as soon as fall 2019 or winter 2020, which would allow for Metro testing, commissioning and training before it takes ownership of the tracks from the Metropolitan Washington Airports Authority and opens the extension for service. Right now, Metro projects that opening is unlikely to happen before the summer of 2020. The first stretch of the Silver Line through Tysons to Wiehle-Reston East opened in July 2014. Construction on this second phase to Dulles International Airport and Loudoun County, Virginia, began in 2013. In 2015, opening was pushed back to at least 2019 and last year, the opening was pushed into 2020. The project remains within its latest budget. 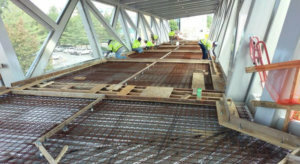 “Almost all of the work on the project now is electrical,” said Charles Stark, the airports authority’s vice president for the Dulles Corridor Metrorail Project. Besides the work on the tracks, at the stations east of Dulles — Reston Town Center, Herndon and Innovation Center — crews are working now on ceilings, electrical installations, elevators and escalators. 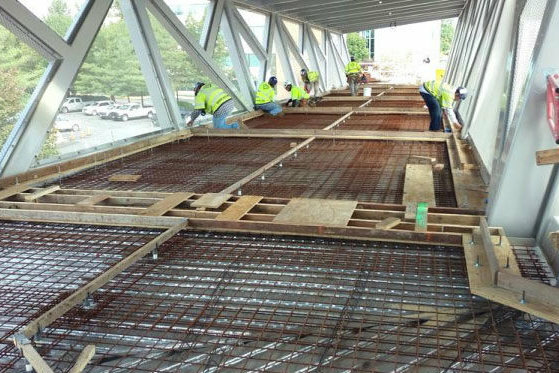 At stations west of Dulles — Loudoun Gateway and Ashburn — crews are installing elevators and escalators, and putting in roofing and lighting for the pavilions that connect to the stations along the Dulles Greenway. At Dulles, a pedestrian tunnel connecting to the Metro station reopened Nov. 13. It goes under the parking lot just outside the terminal to the airport garage, and people walking back and forth can now peek in to see the Metro station entrance. Earlier this year, the airports authority had hoped testing of trains on at least some segments of the tracks could begin as soon as this fall. At the rail yard near the end of the line, a separate contractor is working on finishing buildings and installing industrial equipment. The rail yard recently switched over to a permanent power feed. Changes and delays in construction at the rail yard mean a final completion date is still under negotiations. The latest contract had set substation completion for Dec. 23, but a new project forecast bumps that down the line. The airports authority, Metro and rail yard contractor Hensel Phelps are working on final testing and commissioning plans. “The discussions that we’re having with Hensel Phelps look like they’re going to lead to a Hensel Phelps completion date that will not affect the opening of the Silver Line,” Stark said. The yard is now about 90 percent complete. Crews have begun testing train controls, with the hope of demonstrating train movement around the approximately 11 miles of track in the rail yard starting around the middle of 2019. It appears rail yard completion is being lined up for the second half of next year.